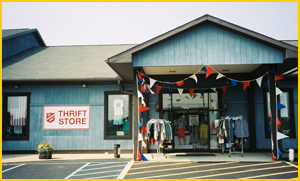 Our Thrifts Store allows our community to purchase next to new items at very affordable prices. The funds raised help to support the valuable programs offered to our community. Donations of clothing, household items and furniture are accepted. Our truck is available by appointment to pick up furniture and large items. Call 570-546-5509 to schedule your pickup. Truck pickups are done on Mondays and Thursdays. Donations are accepted Monday through Friday 9:00 am - 4:00 pm. Donations must be clean items that can be resold in our thrift stores. Below are a list of items not accepted. Donations are tax deductable and receipts are available. Our Thrift Store is in Pennsdale Pennsylvania. At the Halls/Pennsdale exit of RT 220. Hours are 9:00 am - 6:00 pm Monday through Friday and Saturday from 9:00 am - 5:00 pm. The following Valuation Guide is a comprehensive list of items and their donated values. Not all items on this list are accepted by The Salvation Army Thrift Store in Williamsport. A list of those items we do not accept is located below this Valuation Guide.